When Rashad walks into the corner store for a bag of chips, he doesn’t think that the consequences of this action will result in anything more than “chip-breath,” so he plans on buying a pack of gum, too. After all, he can’t have chip-breath when he dances with his crush at a party later that night. But Rashad doesn’t make it to the party. A suspicious store-owner, a klutzy lady, and a fist-happy cop land Rashad in the hospital with a broken nose, broken ribs, and internal bleeding. 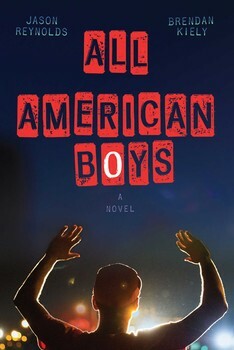 Quinn, a white teen who goes to school and plays basketball with Rashad, witnesses his friend’s brother, police officer Paul Galuzzi, dragging Rashad out of the corner store and wailing on him, despite the fact that Rashad is already handcuffed. Unable to look away, yet unable to do anything to stop the violence, Quinn watches helplessly as Paul hits Rashad again and again. Now, Rashad is in the hospital, wondering why he was never allowed to explain that he wasn’t trying to steal a bag of chips and trying to figure out how he’s going to move forward. Quinn is confused about where his allegiances lie, as Paul helped raise him and the Galuzzis are like family, but he’s sure that Rashad would never do anything to deserve a beat-down like the one Paul gave him. The basketball team is splitting along color lines as the students of color side with Rashad and the white students side with Paul – or decide not to take a stance at all. Their whole town is starting to take sides when a video of Rashad’s arrest ends up online and the hashtag #RashadIsAbsentToday goes viral. At the center of it all, in alternating chapters, Rashad and Quinn struggle with the ultimate question: what now? How can these two teens, so alike and yet so different, come to terms with what happened? How can they possibly make a difference? Who is the “All-American Boy?” Who can you trust, if not the police? What does racism look like in America today? Are you guilty if you do nothing to help? This book is perfect in every way. By telling the story from Rashad’s and Quinn’s points of view, it allows the reader to approach the problem of police brutality and racism from two sides: the victim and the bystander. When it comes down to it, don’t most of us fall into one of these two camps? This is a question that authors Jason Reynolds and Brendan Kiely raise with this novel: if you are not one of the oppressed, and you do nothing to help those who are oppressed, does that mean that you are on the side of the oppressor? While this book may be difficult for some people to read, it is well worth the sadness and pain in order to see the light at the end of the tunnel. This book is timely, well-written, and will surely ignite the necessary discussions that we must have in order to address the national epidemic of racial profiling and police brutality. I would highly suggest this book to anyone, especially those who are struggling to understand their place in the national conversation about police brutality.